Panic ensued Thursday morning after a cougar was spotted around 7:30 a.m. just outside a hospital in Calgary, Canada. The cat was seen on a lawn near the east entrance of the hospital, prompting fish and wildlife officers to be called in. Then, another cougar was reportedly spotted near the stairwell of a parking garage, though police haven't confirmed the second cougar. The hospital was promptly placed on lockdown and people are being warned to avoid the area. "One is on Market Street at a construction site off Seton Way, trapped in an underground parkade in the stairwell. The other is at Front Street on the south side of the hospital, laying on the grass, licking its paws, enjoying the morning sunshine." CBC reporter Kyle Bakx tweeted that wildlife officials have arrived on the scene with tranquilizers. They have also spoken to the Calgary Zoo. Trish Exton-Parder, lead media relations for the Calgary Zoo, told The Dodo that this actually isn't so unusual in Calgary. "It's basically these kinds of things that happen within in the city limits quite often," she said. "Cougar and bears come into the city limits because we're surrounded by the Rocky Mountains. Normally, the zoo doesn't get involved, and lets Fish and Wildlife handle them." At the hospital, authorities have blocked off several doors and are monitoring the first cougar who was spotted. 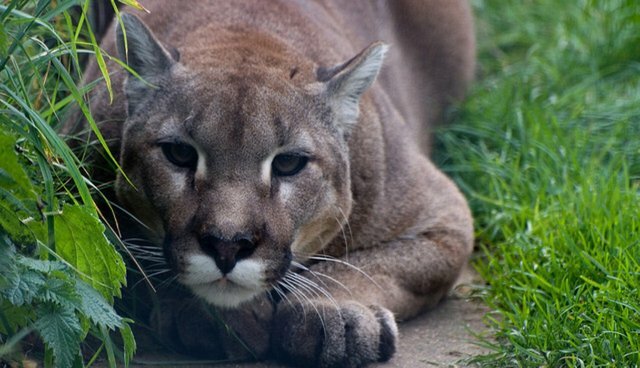 The Dodo has contacted wildlife officials to find out whether the cougars will be released back into the wild. UPDATE: Reporter Kyle Bakx, who is on the scene, tweeted that one cougar was shot dead by officials.